You probably know that Paris is referred to as the City of Light (La Ville Lumière) but did you know that Paris is officially known as Île de France (the island of France)? Here’s an official reminder for us all that Paris is the ‘center’ of France. But our special ‘island of France’ has an actual pair of islands in its very own center and in this post, we’ll be exploring the islands of Paris: Île de la Cité & Île Saint Louis – at the very heart of Paris. Though these aren’t tropical islands obviously, keep reading to discover where there are resemblances. Visiting Île de la Cité & Île Saint Louis is really about traveling back in time. This is after all where Paris started off – as a Celtic settlement on a small island in the middle of the River Seine. 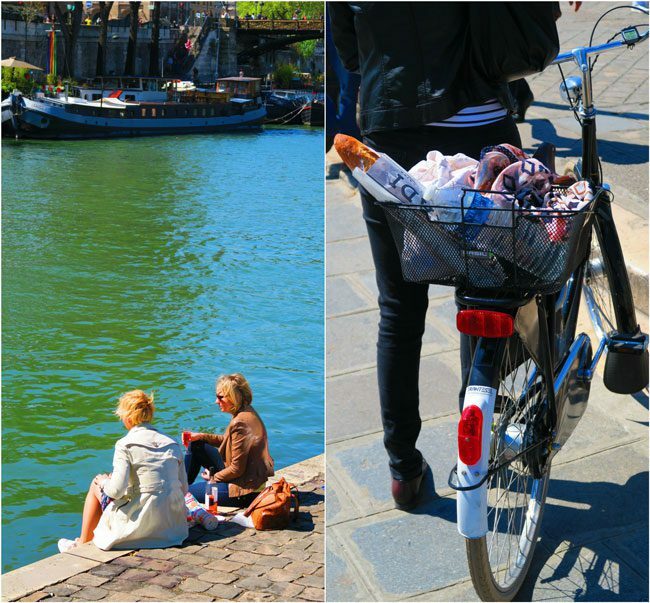 Over the centuries, these tiny islands became home to thousands of Parisians until there was no choice but to expand to the banks and develop the Parisian neighborhoods we know today, such as the nearby Marais. 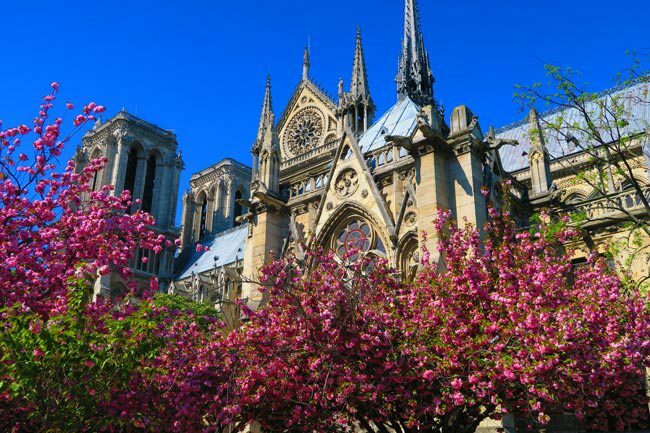 Today, Île de la Cité is home to stupendously beautiful sights such as the Notre Dame Cathedral and Sainte Chapelle, along with excellent urban picnic spots along the banks of the River Seine. Its neighbor, Île Saint Louis, is home to enviously tranquil homes with (multi) million dollar views and the highest concentration of ice cream shops per capita in all of Paris – but more on that later. 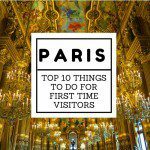 If you’re a first time visitor to Paris, exploring the islands of Paris is a must do and definitely one of the top things to do in Paris. 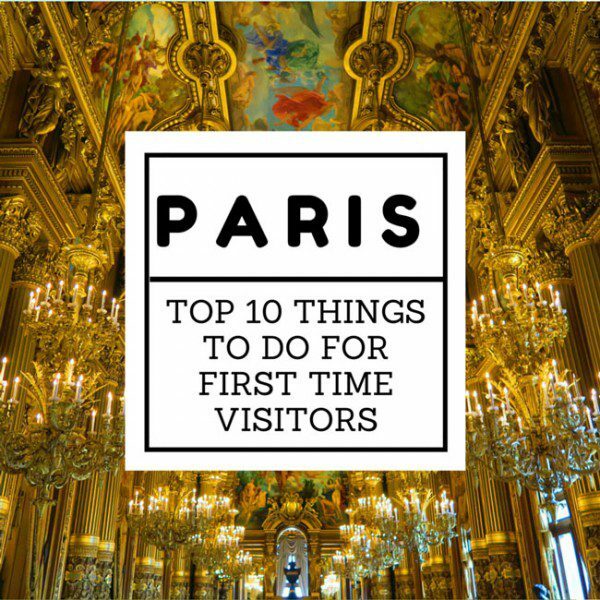 If this isn’t your first time in Paris (and Paris is definitely one of these places you need to come back to), visit the islands to escape the madness of town, as there’s always a quiet little spot to be found somewhere. Before heading to Paris, pick up your own copy of The Rough Guide To Paris (only $17 on Amazon), together with these neighborhood guides, it’ll be your best friend in The City of Lights. 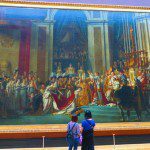 Where to start your visit to the islands of Paris? 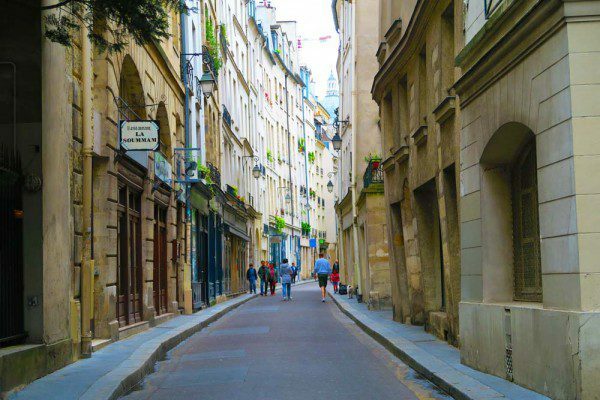 Though it doesn’t make a huge difference, it makes sense to start your day by exploring Île de la Cité and finishing off in the quieter Île Saint Louis. 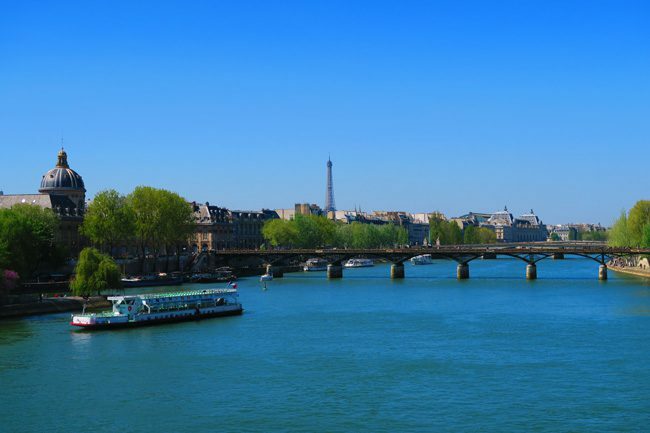 Get off at the Châtelet Metro station and walk along the Seine to Pont Neuf. 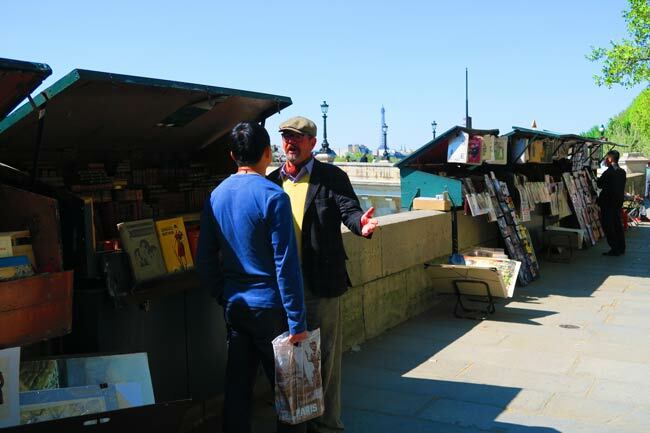 You’ll see here the famous Bouquinistes – the Parisian booksellers whose green wooden stalls can be found along both banks of the Seine in this part of town. Today, many sell tacky souvenirs but you’ll still find a few antique gems here and there. The Pont Neuf is the oldest bridge in Paris and will spoil you with great views down the river and across to Île de la Cité. When to visit Île de la Cité & Île Saint Louis? 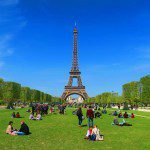 What’s great about exploring the islands of Paris, is that the main attractions are open all week long so you are not restricted in that sense. 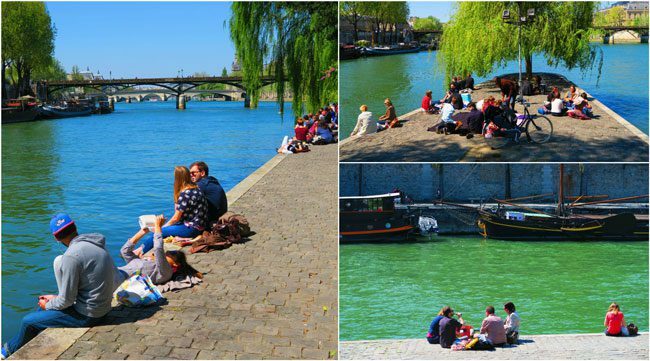 Though a good option for a rainy day itinerary in Paris, the islands are best enjoyed in good weather, as you’ll have the option to relax along the River Seine. That said, we’ll finish off our day on Île Saint Louis, which among other things is also home to the best ice cream in Paris. Some of those shops, especially the one we’ll visit, are closed Monday and Tuesday so perhaps take that into account if ice cream’s your thing! The islands are by no means a secret, so do expect a lot of visitors, especially around Notre Dame and especially during the summer months. 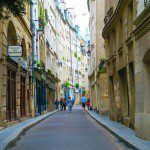 However, once you head into the narrow side streets especially on Île Saint Louis, things get a lot quieter. What to do in Île de la Cité & Île Saint Louis? The most romantic spot in Paris? After crossing the Pont Neuf, you’ll reach a huge statue of Henri IV, the man behind the construction of the bridge (obviously the king did not do any of the heavy lifting, but you get the point). 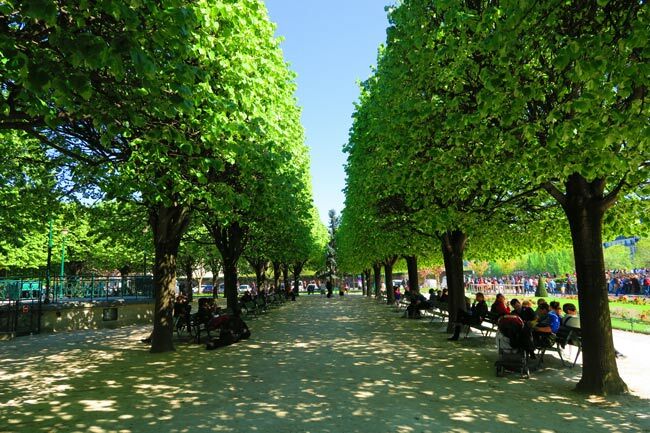 Right below you is the northern tip of the Île de la Cité and a cute little spot that has to be one of the most romantic spots in Paris – the Square du Vert-Galant. 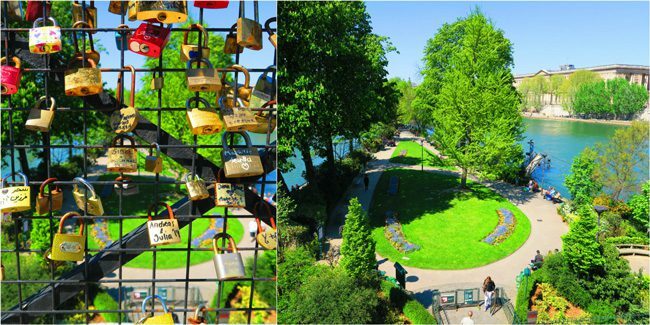 Consider yourself lucky to find a sunny spot in this tiny park but in my opinion, if you haven’t had breakfast yet – stop at a boulangerie (bakery) before getting here and grab a spot along the Seine. 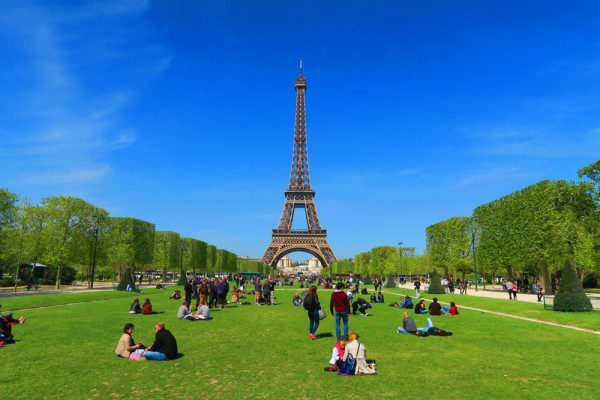 This is prime ‘urban picnic country’ in Paris. When you’ve had enough (or if it’s really time get going), head back up the stairs and across the street to another cute little spot. 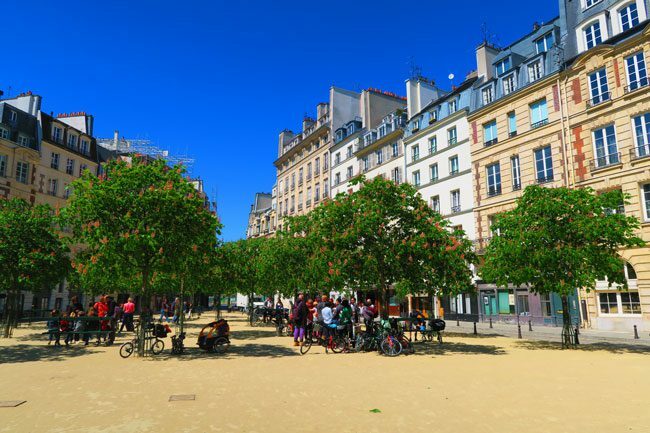 Place Dauphine is an example of why living in one of the islands of Paris does really feel like living on a proper island. Things are really quiet around here. 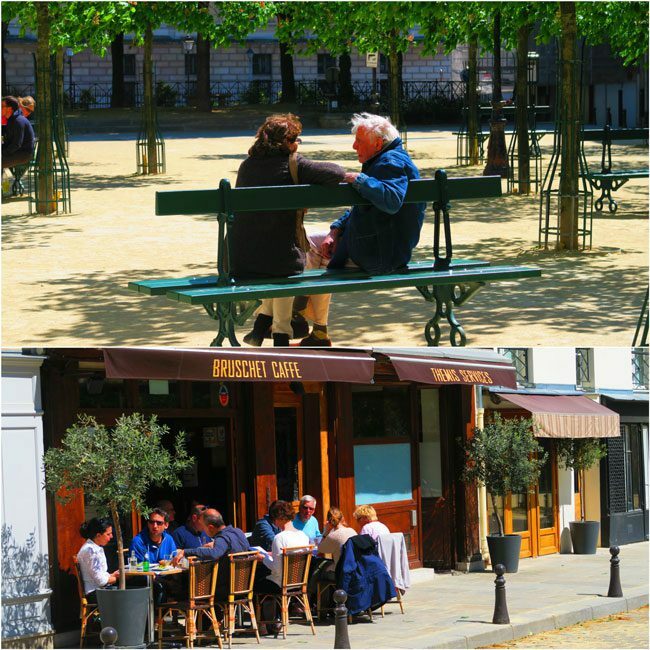 Posh flats overlook this beautiful square that’s dotted with cafes and bistros – anyone got a million Euros to spare? 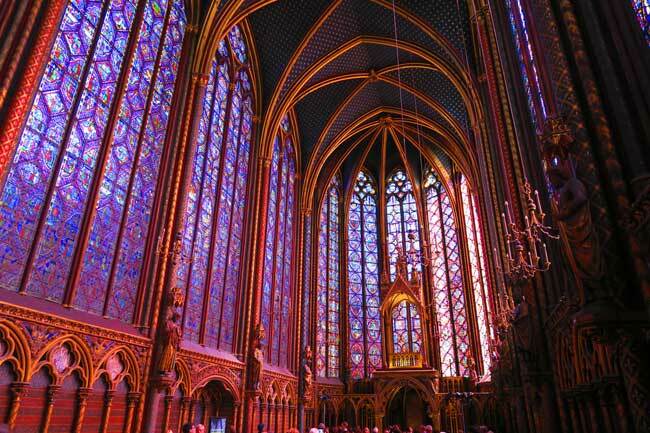 The most beautiful cathedral in Paris? Those with sharp eyes (or if you read this post) will notice a massive Classical building at the edge of Place Dauphine. This is one of the sides of the Palais de Justice where French justice is still being served today. 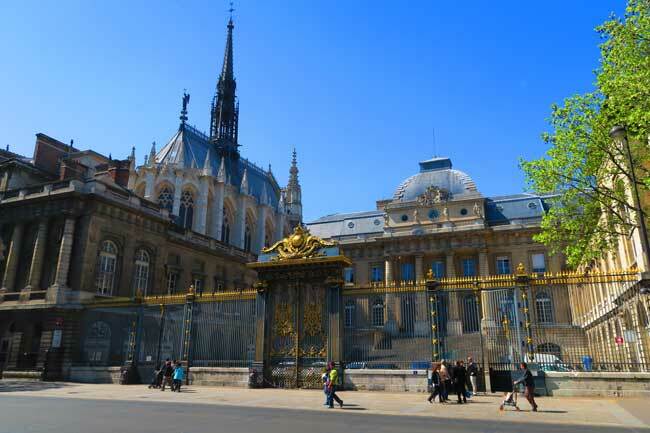 What’s interesting for us though is that the Palais de Justice sits on what used to be a former palace – Palais de la Cité. 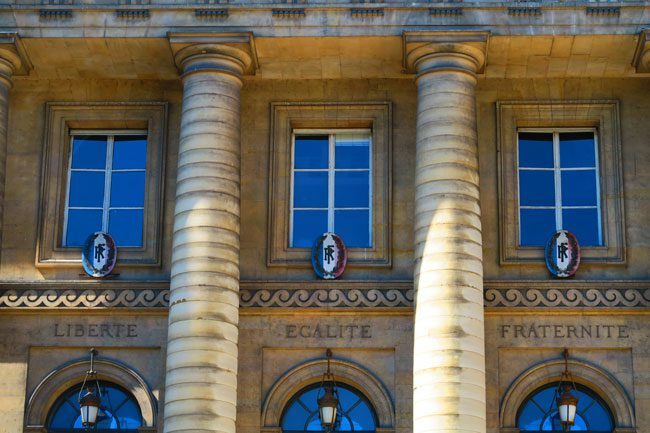 The Palais de Justice is home to two super historical sites. The first is La Conciergerie, a former prison where Marie Antoinette was held before being executed during the French Revolution. 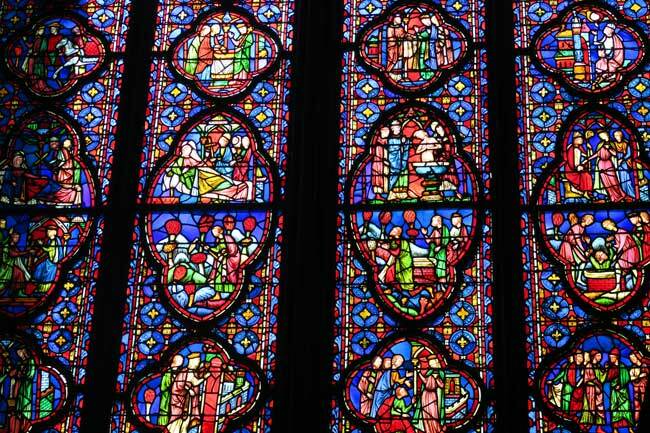 The second is Sainte Chapelle, which we’ll now visit. 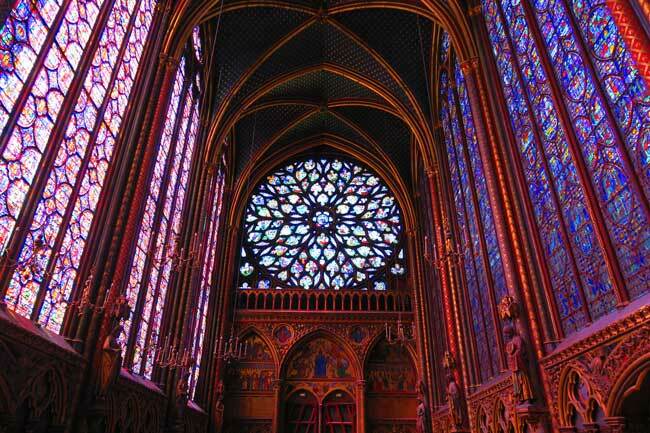 The Sainte Chapelle is a 13th-century gothic chapel that has to be one of the most beautiful things to see in Paris. If you’re around this part of town, you must visit. Tickets go for €8.50 per adult, with an optional combo ticket which also includes the Conciergerie for €13.50. There are two chapels to visit but the one we’re interested in is up a few stairs. The chapel is simply exquisite, mostly consisting of fine stained glass depicting scenes from the bible. It’s best to visit when the sun is shining through for maximum effect. 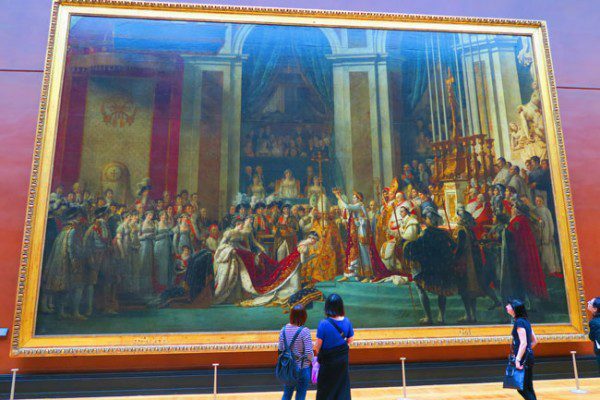 I’ve been to a few churches before – like the majestic Palma Cathedral, the gothic Barcelona Cathedral and Paris’ very own Église du Dôme, among many others. 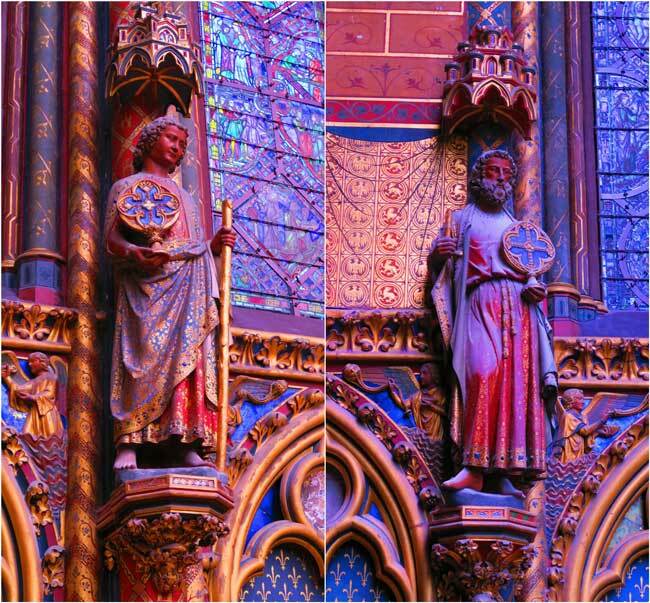 If you read my posts, you’ll know I’m a sucker for ancient European churches – but Sainte Chapelle is something out of this world! I’ll let the pictures do the talking. When you really need to get moving, you can head to the Conciergerie and have a look at an old French prison. I decided to skip this part but I might be back again (I am currently living in Paris for 3 months – lucky me!). Another stop that should not be missed and is just a stone’s throw away, is the Tour de l’Horloge. The tower was built in the 14th century, long before the Rolex and the Apple Watch. 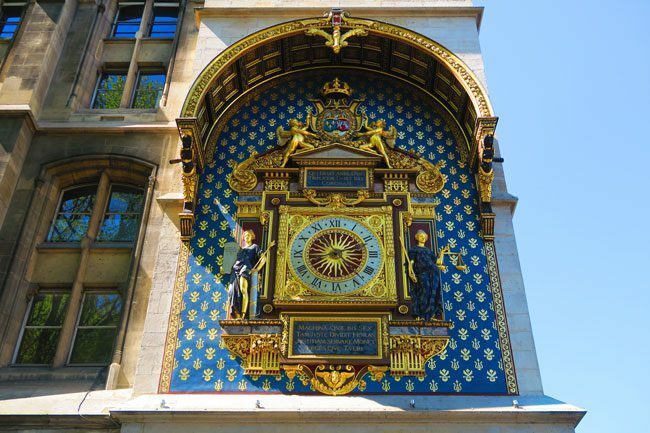 It was the first public clock in Paris and you can imagine how it transformed the local life once installed. Next up is the flower market (marché aux fleurs). You wouldn’t expect this sort of market on the tiny island – but it’s been around since 1830 and still attracts avid gardeners and lots of tourists. 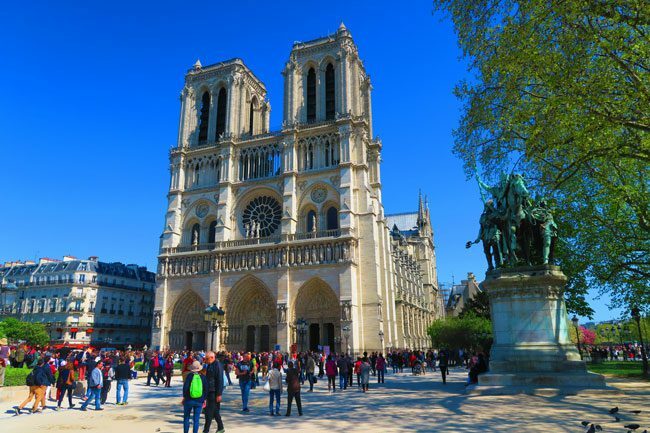 We’re now approaching one of the highlights of our day and definitely, a must do in Paris – the Notre Dame Cathedral (Cathédrale Notre Dame de Paris) – the flagship cathedral of Paris. 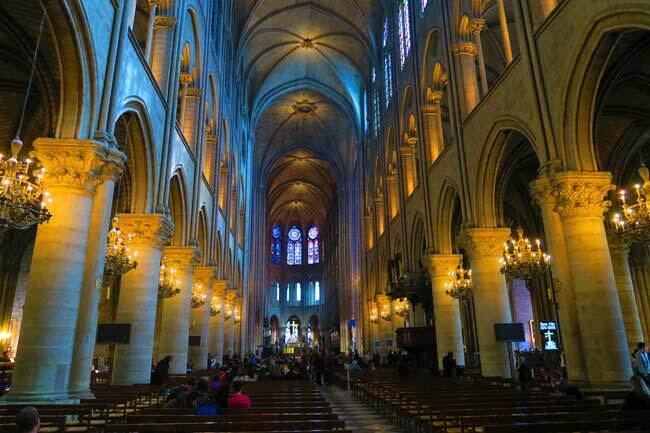 Notre Dame takes up prime real estate on the island and built on the site of other, more ancient cathedrals. In fact, you can head below ground to the Crypte Archéologique (entrance is in the middle of the square) to learn more. If you recall from the opening, the islands of Paris are at the heart of the city, which in itself is at the heart of the country. This brings us to yet another interesting fact. 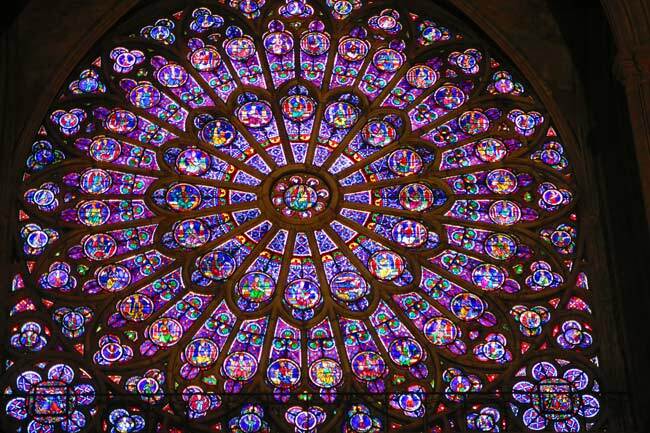 The Notre Dame de Paris is the spot from which distances in France are calculated. 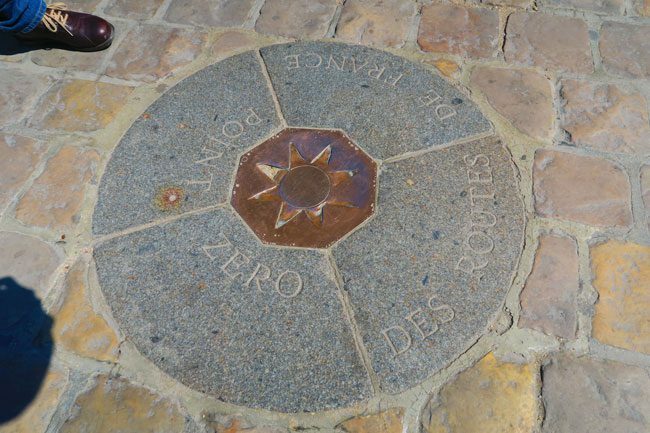 There’s a plaque called the ‘kilometre zero’ in front of the cathedral. I’ll leave you to find it as it’s easier said than done when things are crowded (and they are over here). Back to the cathedral now and the good news is that it’s free! The bad news is that you’ll have to queue up but things move along quickly. Once again, the sharp ones among you will notice that there are people enjoying fine views from the top. It is possible to venture up to the terrace, mind you it involves an entry fee but more importantly – time. 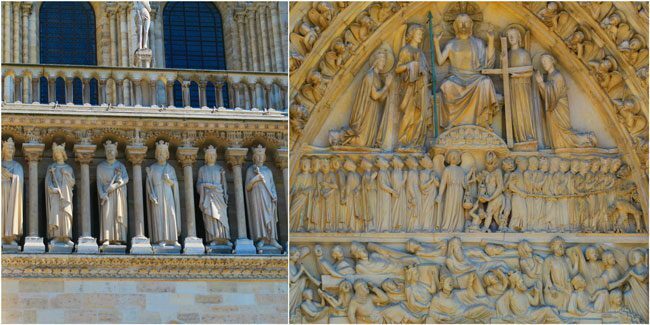 The queue can last for well over 90 minutes but you can skip the lines with this combo tower and guided cathedral tour. Now to the facade of the Notre Dame. Have a look just above the central door for the famous depiction of ‘judgment day’. The rest of the stonework is not too shabby either! Stepping inside, what can I say? this place is so impressive! 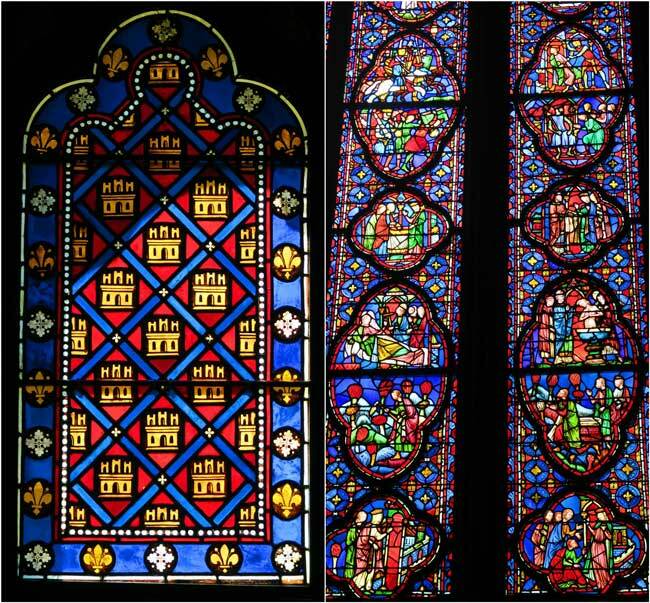 The beautiful stained glass is on display here once again – something of a trend in French Gothic churches. The most impressive features of the interior are by no doubt the massive rose windows aligned across from each other at the nave. Wow! Back outside now, have a walk around the southern and eastern parts of the cathedral. You can see from up close the level of attention that was put in this building and if it’s springtime, catch the cherry blossoms. 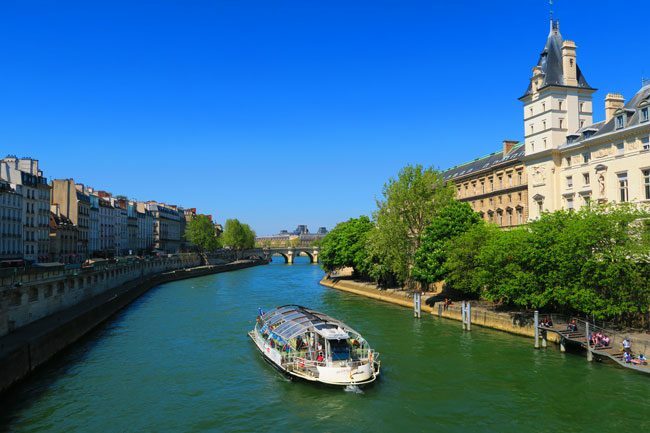 As you head to the Square Jean XXIII, just behind the cathedral, you can also snap a few ‘classic’ Paris photos of boats cruising up the Seine. 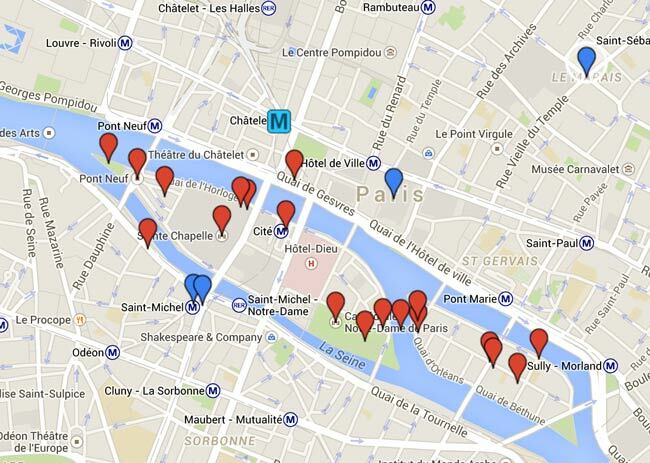 Shall we head over to Île Saint Louis?